It's not often that you'll find me happily using a whole skincare range from one brand, as the mix and match approach seems to work better for me more often than not. I was first introduced to the Kari Gran brand last month, and after using their starter kit religiously for the past 3 weeks, I could definitely see myself becoming loyal to the whole skincare line in the future! They're totally right when they say "most people find that once they try it they are hooked"! 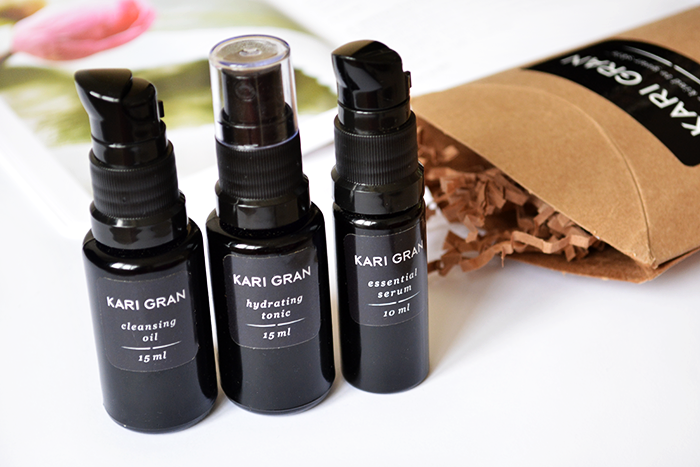 The Kari Gran Starter Kit* contains travel sized bottles of their signature skin care system, including their Cleansing Oil, Hydrating Tonic and Essential Serum. These products are packaged in dark bottles that have a greater purpose than just looking stylish, as they're made from MIRON glass which blocks out the spectrum of visible light to protect the quality of the all-natural ingredients. This skincare system starts off with the Cleansing Oil, designed to be used only once per day in the evening. It contains a simple blend of organic sunflower, avocado, castor seed and lavender oils which are highly effective for a deep clean, while simultaneously balancing the skin's oil production. (Yes, oils really do help to balance the skin)! To use, you apply 8-10 pumps of this relaxing lavender scented oil, massage onto dry skin and then steam off with a hot (not scalding) cloth, which opens pores and removes the oil. I'd probably go as far to say this is the best cleansing oil I've ever tried! My skin has become a lot more balanced and always feels clean and soft after use. I always look forward to using this relaxing cleansing oil every evening and I think I'll really miss having this in my routine. The second step is the Hydrating Tonic which is available in either Lavender or Rose scents (I chose the Lavender). It's very simply made from aloe vera leaf distillate, organic vegetable glycerin and organic lavender oil to hydrate and soothe the skin. To use, just shake the bottle to redistribute the essential oil, then mist 3-4 pumps on the skin to help improve the serum absorption in the next step. I also love using this to set mineral makeup and whenever my skin is feeling in need of a hydration boost throughout the day. To finish off the ritual, the final step is the Essential Serum; a nourishing serum made with blend of organic plant-based and essential oils. I've been using just a small pump for the daytime and 1-2 pumps in the evening depending on how my skin feels. This serum seems to be the perfect balance - not too heavy, not too light, yet still leaves my skin feeling soft and hydrated. Kari Gran also suggests mixing the serum with mineral powder foundation to create a tinted moisturiser which is perfect for a light everyday coverage. These travel size bottles are said to contain a two-week supply, but I still have a small amount left of each after three weeks of generous daily use. Kari Gran ship internationally, but I hope there might be a European stockist at some point in the future to make these products easier to get hold of without worrying about customs charges. This Starter Kit costs $35 (approx. £21.50) and The KG System, which includes all three full sized products, costs $140 (approx. £86). I genuinely think these products are worth the price and, seeing as my skin hasn't looked this good in a long time, I'm really going to miss using this skincare system! P.S. Kari Gran currently has 20% off skincare on their site until 21st September - the perfect time to try out these products for yourself! So now for the exciting part... 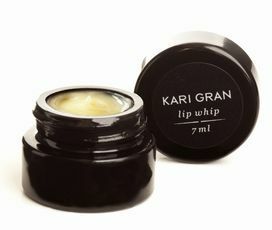 I have one Kari Gran Naked Lip Whip to give away in the Cinnamon-Pimenta Berry flavour! To enter to win, you just have to be a UK resident and submit your entries through the Rafflecopter widget below. Good luck! Have you tried any Kari Gran products before? Lovely! I have been coveting their brand for a while now and have my eye set on trying the cleansing oil, serum, and lip whip. I love it when brands make try me kits - such a great way tot introduce yourself to a new line and see how the products work together. The tonic sounds great. Think I would choose rose. I've been looking for a new toner so that send to tick the boxes for me. Also love cinnamon almost to the point of obsession so this all sounds very lovely.